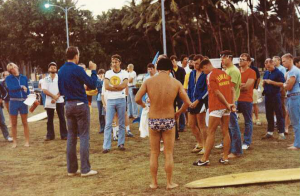 Der Amerikaner Dave Orlowski ist einer der 15 legendären Marines, die am 18.02.1978 auf der hawaiianischen Insel Oahu den allerersten Ironman bestritten. Lassen Sie sich von seinen Erinnerungen an seinen wohl härtesten Tag inspirieren. The first Ironman took place on February 18, 1978 on the island of Oahu in Hawaii. The original Ironman was conceived and put on within two months by John and Judy Collins. This event was the result of an argument about “who was the fittest athlete?” I was part of a Marine running team that participated in an around the island race. The awards for this event were held at the Primo beer gardens on Oahu. John Collins was also at this awards ceremony and engaged in an argument with one of my team members, Tom Knoll, about “who was the fittest athlete?” Tom Knoll was a runner and ultra marathoner and the argument consisted of who was the fittest athlete between the runner, cyclist and swimmer. Of course beer was being served and as most can imagine that is how crazy things like this get going. I was sitting next to them arguing but had no concern and did not hear the argument. They were 40 something guys and I was a Marine on a fixed income, drinking free beer, eating free food and looking at fit beautiful women. I was 22 years old and did not have to argue about it because I knew I was in shape at this point of my life and the other things were more important. John Collins stood up at this awards ceremony and declared a challenge. John Collins stated that they would put the three main athletic events on the Island of Oahu together. 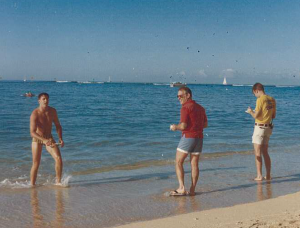 Those events were the 2.4 mile Waikiki rough water ocean swim, the 112 mile perimeter bike race and the 26.2 mile Honolulu marathon together. The three events would be combined into one race in one day with no time limits. John Collins stated that anyone able to complete all these events in one day would then be called an Ironman and have bragging rights for the rest of their life. The next day I went to work and Tom Knoll, who worked in an office next to me, asked if I was going to enter in the event. 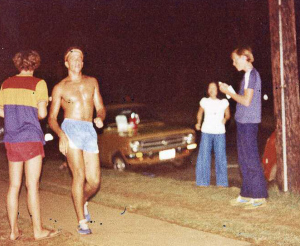 I had just run the Honolulu marathon in December 1977, my first marathon and the first long distance event that I had participated in. Without hesitating Tom then stated “hey kid just give me your five dollars” to enter the event. My good friend and fellow Marine Mike Loyd also entered the event. Imagine, it cost five bucks to enter the Ironman for the first time. A total of fifteen people entered the event although the odds were against anyone finishing this event. Of the fifteen people that entered, twelve of us proved all disbelievers wrong and I finished in third place. The original event was not a race or competition between anyone. It was a challenge to see if anyone could finish this type of grueling event. Tom knoll finished in sixth place but my friend Mike Loyd made it through a better part of the run but could not hang on to finish. All the trophies for the event were hand made by John Collins from copper tubing and bolts mounted on a piece of wood. Each trophy had a plaque attached to it stating “Finisher 1978 Hawaiian Iron Man Triathlon 2.4 mile swim 112 mile bike ride 26.2 mile run”. There was no finishing place designation as this was not a race just to see if anyone could complete this. The shirts consisted of a handmade silk screen that John Collins made. We provide shirts that John and Judy Collins made at their naval home and baked in the oven of their home to set the ink. John and Judy Collins had the meetings at their home and organized everything for race day. In the beginning there were no such things as “bricks”, training or nutrition plans, aid stations or spectators other than the people who came out to support those athletes they knew doing the race. For the most part no one knew this event was taking place as you were on your own out there. My training prior to the race consisted of swimming about 1 – 1 ½ miles three times a week and running six days with the longest run being about twelve and fifteen miles. I had no bike for the event and had never been a cyclist and did not worry about the bike until a week before the event. 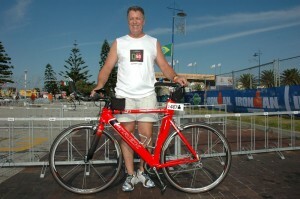 I borrowed a Sears Free Spirit 10 speed bicycle from a fellow Marine for the event. This was your standard off the showroom floor bicycle with no bottle cages and no toe clips, just standard pedals. On the day of the event I did not even have a spare tire or tube if I would have flatted. If something would have happened, I would have been out of the event and not part of this history. I figured as long as I rode a bike as a kid that I could just get on the bike and ride 112 miles to do this. As most of you know and I do now that it is a hell of a long way. What do you tell a Marine who has been brainwashed that you can do anything. Well that strong mental discipline that they engrain in you did make this event possible for me. Marines don’t quit!! I did ride this bicycle about a total of 30 miles before the event. As far as my other equipment I used the same shoes for cycling as I did for running. This was a regular pair of adidas running shoes and I did not wear socks. As you can imagine they were quite ripe at the end of the event from sweating. I did not have cycling shorts and did not know what to wear. The night before the event we were having a meeting between Tom Knoll, Mike Loyd and myself along with our Marine support crew. Our support crew was handling all three athletes. Because I did not have bottle cages or a way to keep nutrition on my bicycle, I took a pair of blue jeans pants and cut them off to be shorts for the bicycle portion of the race. The idea was that I would then have pockets that I put money in to make stops when in need of fluids or nutrition. On Race day morning John Collins gave a briefing and John and Judy passed out photo copied maps of the course and rules for the athletes. The official timing was kept by Judy Collins and well as placing. The swim was then started. Each athlete was required to have their own person in the water in case of emergency. My person was Jim Terrell, a fellow Marine, who was on a surfboard. A short distance into the swim I observed a shark while I was swimming as the water visibility is very clear. Having been a diver I knew this was probably a nurse shark and did not really alarm me but did make my heart race a little more. It soon swam off. I exited the water feeling pretty good and was off in my cutoff jeans aka cycling shorts with a blue visor and running shoes. Off I went money in pockets, race map and Sears Free Spirit bike. We were bound by traffic laws and lights as the course was not shut down. As it turned out my support crew was not found for many portions of the bike. I relied on gas stations, food stores and even a McDonalds where I sat and had a meal. I left my bike outside the grocery store and ran in worried that my bike would not be there when I got out. Hawaii is not crime free but when I did exit the bike was still there. The majority of my diet was banana’s, oranges, water, Hershey bars and loved Coca Cola. I guess the caffeine and sugar were today’s equivalent of Gatorade. The course was challenging but rode well to about mile 80. The heat and humidity caught up with me and was forced to dismount the bike due to cramping. I was on the North Shore and this was the hills and cramping was taking over. Did a fair amount to get up the hills and then moved onto the bike finish. I changed into some fashionable nylon running shorts and put on a sweatband and went out onto the course. Having no idea of brick workouts I found that my legs could barely move to walk much less run. The legs kept buckling and giving out and I began to wonder if this would be the end for me. I just kept going and at about four miles the running legs kicked in and I ran strong to about seventeen miles. At this point I began using Ben Gay (heat rub to relieve muscle pain) and cramping and the walk was on again. I ran and walked to about mile twenty two and found myself grabbing onto a guardrail pulling myself up a hill and barely making it. My support vehicle pulled alongside me and the side door opened and to my amazement my parents were in the vehicle. They had flown to Hawaii to surprise and visit me. By luck they found my Marine support vehicle in Waikiki who brought them to me. To this day I still cannot believe this happened because no one really had any idea this race was going on. The kiss and hug of support energized me to where I suddenly was able to run with no pain and ran the final four miles to complete the event. The finish line was empty except for Judy Collins and her daughter with a stop watch. The finish of the Ironman has been a life changing event for me as well as for any individual that I know that has completed one. It pushes your limits and you find things out about yourself as well as what you are able to do. It gives you confidence that carries over into your everyday life. After not doing any Ironman since 1978 I was granted a slot for the 2008 Kona Ironman World Championships. I again completed this with much emotion to be called an Ironman by Mike Reilly, the voice of Ironman. Since this I have decided to embark on a journey to do all full Ironman races around the world. I have met so many people from where Ironman is held. I want to visit the countries and do the events as well as share in the beauty of the country and culture of the people. I also want to keep the history of this event alive showing people what it took the people to start an event like this and see what it is today. I plan to do all these events in five years, finishing at the 35th anniversary of Kona. Dieser Eintrag wurde veröffentlicht in Panorama und verschlagwortet mit IRONMAN, Kona 2017 von Klaus Arendt. Permanenter Link zum Eintrag.